For the magazine journalist, see Theodore H. White. Terence Hanbury "Tim" White (29 May 1906 – 17 January 1964) was an English author best known for his Arthurian novels, The Once and Future King, first published together in 1958. One of his most memorable is the first of the series, The Sword in the Stone, published as a stand-alone book in 1938. He was born in Bombay, British India, to English parents Garrick Hanbury White, a superintendent in the Indian police, and Constance Edith Southcote Aston. White had a troubled childhood, with an alcoholic father and an emotionally cold mother, and his parents separated when he was 14. White went to Cheltenham College in Gloucestershire, a public school, and Queens' College, Cambridge, where he was tutored by the scholar and occasional author L. J. Potts. Potts became a lifelong friend and correspondent, and White later referred to him as "the great literary influence in my life." While at Queens' College, White wrote a thesis on Thomas Malory's Le Morte d'Arthur, and graduated in 1928 with a first-class degree in English. White then taught at Stowe School in Buckinghamshire for four years. In 1936 he published England Have My Bones, a well-received memoir about a year spent in England. The same year, he left Stowe School and lived in a workman's cottage nearby, where he wrote and "revert[ed] to a feral state", engaging in falconry, hunting, and fishing. White also became interested in aviation, partly to conquer his fear of heights. White's novel Earth Stopped (1934) and its sequel Gone to Ground (1935) are science fiction novels about a disaster that devastates the world. Gone to Ground contains several fantasy stories told by the survivors that were later reprinted in The Maharajah and Other Stories. White wrote to a friend that in autumn 1937, "I got desperate among my books and picked [Malory] up in lack of anything else. Then I was thrilled and astonished to find that (a) The thing was a perfect tragedy, with a beginning, a middle and an end implicit in the beginning and (b) the characters were real people with recognizable reactions which could be forecast.... Anyway, I somehow started writing a book." The novel, which White described as "a preface to Malory", was titled The Sword in the Stone. Published in 1938, it tells the story of the boyhood of King Arthur. White was also influenced by Freudian psychology and his lifelong involvement in natural history. The Sword in the Stone was critically well-received and was a Book of the Month Club selection in 1939. In February 1939, White moved to Doolistown in County Meath, Ireland, where he lived out the Second World War as a de facto conscientious objector. In Ireland, he wrote most of what would later become The Once and Future King; two sequels to The Sword in the Stone were published during this time: The Witch in the Wood (later cut and rewritten as The Queen of Air and Darkness) in 1939, and The Ill-Made Knight in 1940. The version of The Sword in the Stone included in The Once and Future King differs in several respects from the earlier version. It is darker, and some critics prefer the earlier version. The war had a profound effect on these tales of King Arthur, which include commentaries on war and human nature in the form of a heroic narrative. In 1946, White settled in Alderney, the third-largest Channel Island, where he lived for the rest of his life. The same year, White published Mistress Masham's Repose, a children's book in which a young girl discovers a group of Lilliputians (the tiny people in Jonathan Swift's Gulliver's Travels) living near her house. Mistress Masham's Repose was influenced by John Masefield's book The Midnight Folk. In 1947, he published The Elephant and the Kangaroo in which a repetition of Noah's Flood occurs in Ireland. In the early 1950s, White published two non-fiction books. The Age of Scandal (1950) is a collection of essays about 18th-century England. The Goshawk (1951) is an account of White's attempt to train a northern goshawk using traditional, rather than modern, falconry techniques. Written at his cottage in the mid-1930s, it was published only after its chance discovery by and at the insistence of White's agent, David Garnett. In 1954 White translated and edited The Book of Beasts, an English translation of a medieval bestiary, originally written in Latin. In 1958, White completed the fourth book of The Once and Future King sequence, The Candle in the Wind, which was first published with the other three parts and has never been published separately. White lived to see his work adapted as the Broadway musical Camelot (1960) and the animated film The Sword in the Stone (1963), both based on The Once and Future King. White died of heart failure on 17 January 1964 aboard ship in Piraeus, Athens, Greece, en route to Alderney from a lecture tour in the United States. He is buried in First Cemetery of Athens. In 1977 The Book of Merlyn, a conclusion to The Once and Future King, was published posthumously. His papers are held by the University of Texas at Austin. According to Sylvia Townsend Warner's 1967 biography, White was "a homosexual and a sado-masochist." He came close to marrying several times but had no enduring romantic relationships. In his diaries of Zed, a young boy, he wrote: "I have fallen in love with Zed [...] the whole situation is an impossible one. All I can do is behave like a gentleman. It has been my hideous fate to be born with an infinite capacity for love and joy with no hope of using them." Broadcaster Robert Robinson published an account of a conversation with White, in which he claimed to be attracted to small girls. Robinson concluded that this was really a cover for homosexuality. Julie Andrews wrote in her autobiography, "I believe Tim may have been an unfulfilled homosexual, and he suffered a lot because of it." However, White's long-time friend and literary agent, David Higham, wrote, "Tim was no homosexual, though I think at one time he had feared he was (and in his ethos fear would have been the word)." Higham gave Warner the address of one of White's lovers "so that she could get in touch with someone so important in Tim's story. But she never, the girl told me, took that step. So she was able to present Tim in such a light that a reviewer could call him a raging homosexual. Perhaps a heterosexual affair would have made her blush." Lin Carter in his book Imaginary Worlds portrayed White as a man who felt deeply but was unable to form close human relationships due to his unfortunate childhood: "He was a man with an enormous capacity for loving. It shows in his prodigious correspondence and in his affection for dogs and in the bewildered and inarticulate loves his characters experience in his books; but he had few close friends, and no genuine relationship with a woman." White was agnostic, and towards the end of his life a heavy drinker. Warner wrote of him, "Notably free from fearing God, he was basically afraid of the human race." Fantasy writer Michael Moorcock enjoyed White's The Once and Future King, and was especially influenced by the underpinnings of realism in his work. Moorcock eventually engaged in a "wonderful correspondence" with White, and later recalled that "White [gave] me some very good advice on how to write". J. K. Rowling has said that White's writing strongly influenced the Harry Potter books; several critics have compared Rowling's character Albus Dumbledore to White's absent-minded Merlyn, and Rowling herself has described White's Wart as "Harry's spiritual ancestor." Author Neil Gaiman was asked about the similarities between Harry Potter and Gaiman's character Timothy Hunter, and he stated that he did not think Rowling had based her character on Hunter. "I said to [the reporter] that I thought we were both just stealing from T. H. White: very straightforward." Gregory Maguire was influenced by "White's ability to be intellectually broadminded, to be comic, to be poetic, and to be fantastic" in the writing of his 1995 novel Wicked, and crime fiction writer Ed McBain also cited White as an influence. White features extensively in Helen Macdonald's H is for Hawk, winner of the 2014 Samuel Johnson Prize for non-fiction. One of the components of the book is a biographical account of White and also The Goshawk, an account of his own failed attempt to train a hawk. ^ a b c d e "T. H. White Dead; Novelist was 57" (fee required), The New York Times, 18 January 1964. Retrieved on 2008-02-10. ^ a b c Craig, Patricia. "Lives and letters," The Times Literary Supplement, 7 April 1989. p. 362. ^ Annan, Noel. 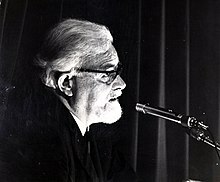 "Character: The White-Garnett Letters and T. H. White" (book review), The New York Review of Books 11.8, 7 November 1968. Retrieved on 2008-02-13. ^ a b c d Allen, Walter. "Lucky In Art Unlucky In Life" (fee required), The New York Times, 21 April 1968. Retrieved on 2008-02-10. ^ a b Townsend Warner, Sylvia (1978). "The Story of the Book". In White T.H. (ed.). The Book of Merlyn. London: Fontana/Collins. ISBN 0-00-615725-4. ^ "The Importance of The Second World War to T. H. White's "Once and Future King"". Archived from the original on 29 May 2008. Retrieved 30 April 2008. ^ Keenan, Hugh T. “T(erence) H(anbury) White” in British Children's Writers, 1914-1960, ed. Donald R. Hettinga and Gary D. Schmidt, Gale Research, 1996. ^ a b c Jameson, Conor (January 2014). "A place for the misfit". British Birds. 107 (1): 2–3. ISSN 0007-0335. ^ Wilson, A. N. "World of books: The knights with right on their side", The Telegraph, 3 June 2006. Retrieved on 2008-02-10. ^ Cantwell, Mary. "Books of the Times: Letters to a Friend" (book review), The New York Times, 10 September 1982. Retrieved on 2008-02-13. ^ a b Hudson, Patrick. "Fifty Percent Fiction: Michael Moorcock" (interview), The Zone, 2001–2002. Retrieved on 10 February 2008. ^ "Real Wizards: The Search for Harry's Ancestors". Channel4.com. 2001. Retrieved 1 June 2007. ^ "JK (JOANNE KATHLEEN) ROWLING (1966–)". The Guardian. Retrieved 8 October 2007. ^ Richards, Linda (August 2001). "January Interview: Neil Gaiman". ^ Nolan, Tom. "Gregory Maguire Brews Another Wicked Mix of Historical Fiction & Timeless Myth", Bookselling This Week, 16 September 2003. Retrieved on 2008-02-10. ^ "What Authors Influenced You?" Archived 27 September 2007 at the Wayback Machine, Authorsontheweb.com. Retrieved on 10 July 2007. Warner, Sylvia Townsend (1967). T. H. White: A Biography. New York: Viking.